All over America millions of families are destroyed by a broken legal system. Not about justice or what is best for the children. Far often than less it’s based on how much money lawyers and the state will profit. Why would anyone in their right mind want to marry after finding out what really happens when it goes wrong? This video came to our attention in regards to a man whose trying to do right, loves his children and country. Yet like so many others becomes victimized in a court of law. Why is it in America justice is based on how much money you have and not the truth? Where someone can go to court, lie and manipulate the system. Soldiers fighting for their country come back to a system that holds their service against them. Abuses those who fight for your freedom. Stop the cover up and lies. Don’t Let Family Court Defraud You! State courts destroying Families, veteran warns! 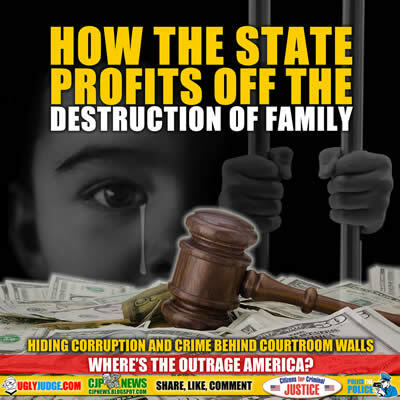 Channel 11 Exposes need to reform NJ family court New York’s. Why are so many people getting violent?